Home » Infrastructure » Railway network for the Philippines? Railway network for the Philippines? We start November with an article about railways. There seems to be a lot of buzz about rail these days including talks about the prospects of a subway line in Metro Manila and long distance north-south lines for Luzon Island. These projects, though, will take a lot of time to be constructed and operational, even if these projects started immediately (i.e., next year). That is perhaps one reason why these projects need to be implemented sooner rather than later. And the more these projects are delayed, they become more expensive and also difficult to build (e.g., there are other developments such as roads that may hamper rail and other mass transit projects). I had a couple of students who did research a little over three years ago on the state and operations of the Philippine National Railways (PNR). Aside from the research manuscript, their work has not been published. The results, however, seems quite appropriate these days as the country and Metro Manila in particular grapples with problems pertaining to commuting that is dominated by road-based transport. I will write about their results here but only show some excerpts as we intend to have part of their work published. As a first salvo, here’s a map that they were able to get from the Philippine National Railways (PNR). The map shows current and proposed railway lines throughout the country. These include the PNR Main Line South (MLS), which extended to Laguna, Batangas, Quezon, Camarines Norte, Camarines Sur and Albay. There is also what used to be the PNR Main Line North (MLN) that extended to Bulacan, Pampanga, Tarlac, Pangasinan and La Union. 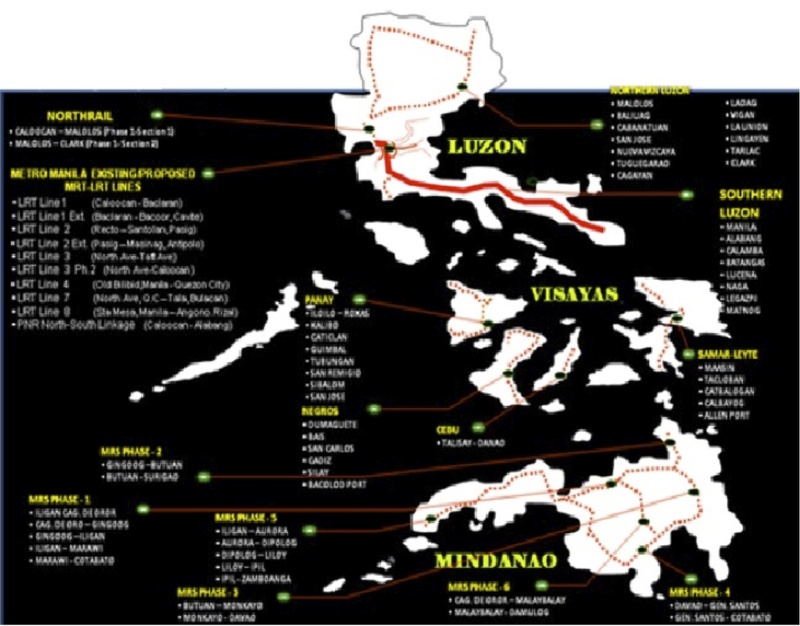 Panay Railways, the only other long distance railway system aside from the PNR as late as the late 1970s, is also in the map along with the proposed Mindanao Railways. This map was provided by the PNR and likely includes data coming from the Rail Transport Planning Division of the Department of Transportation and Communications (DOTC). Contrary to the perception of many in the current administration, a lot of railway planning was conducted by past administration and many were sound ideas that justified feasibility studies. As usual, the main obstacle for railways would be the competition with road transport. It was road transport and the construction of expressways and other highways, after all, that dealt the PNR its decline (and death in the case of the MLN) to what remains today. By d0ctrine in Infrastructure, Railways on November 1, 2015 .